Sister Lakes in Southwest Michigan. Please email first to confirm your dates are available which is outlined below. Calendar is not updated daily. This home is on Magician Lake which is a 528 acre All Sports Lake in the Sister Lakes area and in high demand. 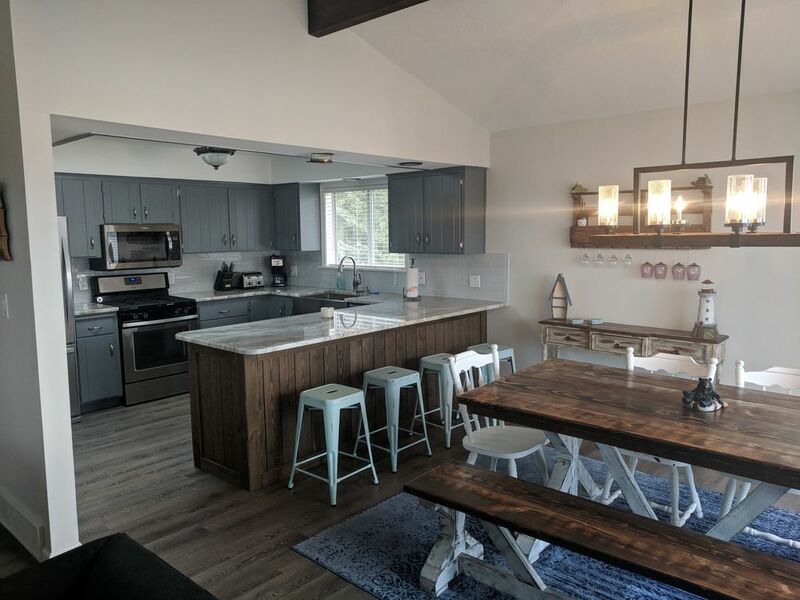 Home has been renovated in 2018 so everything is new and sleeps up to 16 . Enjoy evening stars with family and friends by the Firepit Lakeside (firewood provided). 55 ft. of Lakefront to swim or fish. Home has 4 bedrooms, 2 baths, finished walk-out basement, large wrap around deck with Gazebo with plenty of seating over looking the Lake. * Closet full of board games. *Parking for up to 6 cars (for additional parking contact me). * I'm taking delivery of a new 2018 Harris Pontoon this upcoming May which is available to rent. Magician Lake has a Sand Bar where many anchor there boats to have fun in the sun with friends and family. The Lake is known for good fishing with Northern Pike, Large Mouth, Walleye and Blue Gill. Sister Lakes area has the famous Driftwood Ice Cream Parlor, Sister Lakes Brewery, The Strand Restaurant, 5 Mile Drive-In and a few others. Near by is St Joe, New Buffalo, South Haven, Lake Michigan, Saugatuck. If you're into wine, Magician Lake has many Winery's close by. I've worked very hard to make sure all families have a great time at our Lake House. Home rentals on Magician Lake are in high demand. This home is normally fully booked 8-12 months in advance so book now before to late. My Calendar is not always updated so if home is booked, I have two other homes in the area that you can contact me on as well. Please email first to find out availability. I live in the Southwest suburbs of Chicago. I work on a local Fire Department in Illinois and have been coming up to Magician Lake since I was 10 years old. I have worked very hard to make sure that the families who stay at my home have the best experience possible. Great views! Unite comfortable. Really clean. Great place. Lots do to in the area. Awesome view of the water. Would definitely book again. Thank you for the kind words. We look forward to seeing you next year!! Beautiful home! Home was exactly as described with great furnishings, a wonderful layout, and very comfortable. A home, away from home! There was a wonderful large deck with just the right amount of shade/sun and an amazing view of the lake. Bill, the home owner, was great...super helpful and accomodating. Absolutely beautiful lake! Fun restaurants near by with great food and drinks. We will definitely be back! Thanks Amanda, thanks for the kind words. We work very hard to make sure that the families that come to our homes have a great time and have the basics that are needed. Looking forward to seeing you again in the future.